There are two types of people reading this review. On one hand, maybe you've never heard of Space Harrier before, or if you have, you don't know much about it. On the other hand, maybe you have already played enough Space Harrier, or you already have a favorite version. 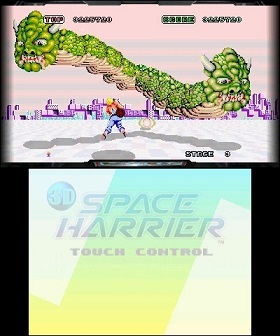 An arcade perfect port of Space Harrier is not hard to come across, especially since it's on Wii's Virtual Console and was a part of Sonic's Ultimate Genesis Collection. For those in the former bunch, Space Harrier is a 3D space shooter on rails. You can move Harrier side to side and up and down, but he flies forward into the environment automatically. You can't choose where he goes; you can only make him shoot oncoming enemies or dodge obstacles. Space Harrier appeals to the heart of what makes any media entertaining. You will have to observe opposing forces and reconcile them. The ceiling stages contrast poles with dodecahedrons. The poles cover an entire vertical space, while the dodecahedrons spawn at the top and bottom of the screen in turn. You'll need to gather an up-and-down rhythm to evade them. Let's uh, unpack what that means for Space Harrier in particular. In stage 2, Geeza, you'll dodge stationary pillars as Harrier flies forward. These pillars are not placed in any predictable pattern; instead, they seem randomly placed, and you'll have to figure out how to dodge each one as it comes. At the same time, floating heads will fly in circle patterns and shoot at you. Since they move in a circle in the center of the screen, these enemies are easy to follow. This creates a simple but satisfying contrast. 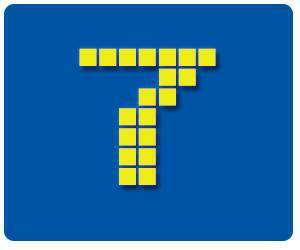 You must swerve out of the way of unpredictable pillars while shooting down enemies that follow predictable patterns. And this sense of contrast develops over the course of the game. In stage 13, Drail, there are three enemies that appear in turn: jets that cover wide spaces at the top of the screen, robots that sweep wide spaces at the bottom of the screen, and drone enemies that criss cross between the top and bottom of the screen. And the game has plenty of weird enemies to gaze upon--when you're not too busy blasting them to bits. If this is your first time playing, I recommend dropping one coin in at a time. If you game over, the game offers a stage select, letting you pick up at the start of the stage where you lost your game. It's possible to blaze through the game without effort by slamming in a bunch of coins on the title screen, but I find going one coin at a time required me to learn how to play each stage well without getting overly frustrated. But maybe you've played plenty of Space Harrier already. This 3DS port is a loving one, with options as practical as a difficulty select and as extraneous as a tilting screen to simulate the arcade cabinet. The best features are ones you might not expect. 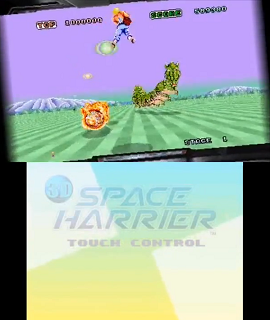 Using a stylus on the bottom touch screen, you can control Harrier on the top screen. He'll automatically fire shots (at a rate you can adjust in the options menu), so you don't need to worry about handling any buttons while guiding him around with a stylus. This takes a little learning, since moving your stylus faster than Harrier will result in him lagging behind (can't let you cheat by moving him as fast as you like, right?). Once I got the hang of it, though, I found it gave me finer control than a control pad or circle pad, allowing me to dodge things by the skin of my teeth where before I'd careen right into an oncoming pole. Have I been transported through time to a mid-1980s arcade? No, it's just a really weird option to have in a game. This screenshot also features the bottom screen, which can be used for stylus control if you like. And there's Haya Oh, the extra final boss from the Master System version of Space Harrier. Like most of the bosses in Space Harrier, he's nothing to write home about, but the mere gesture of adding him plays on nostalgia nicely. On the more predictable side of inclusions, 3D Space Harrier has—of course—stereoscopic 3D support. I found this unimpressive; at times it looked shallow, like nothing new. At other times, I had trouble following the action with 3D on. It's strange that the namesake of this game becomes the least important addition, but I'm not going to complain if stereoscopic 3D is the least substantive part of a port. Stage select might not be a surprise either, but it's certainly appreciated. Getting to go back to any stage I like and replay it is always a welcome inclusion, and it definitely fits a handheld console, where I might want to pick up at some random point for short play sessions. The action here is fast, simple, and best of all, finely honed. It doesn't take a rocket surgeon to clear 3D Space Harrier, but its intelligent design is worth experiencing. If you're already a Space Harrier fan, it's at least worthwhile to try out the optional touch screen control scheme, which I reckon is unlike any other Space Harrier control scheme and allows for great precision.